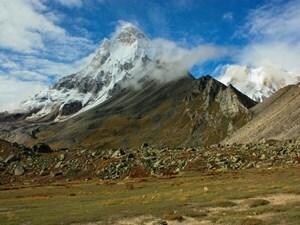 Tapovan trek is a spectacularly different trail inside Bhagirathi river valley to high up at the base of majestic Mt. Shivling. Tapovan (4,270 m/14,270 ft) a patch of green, situated on the west bank of Gangotri glacier amidst glacial moraine and debris. 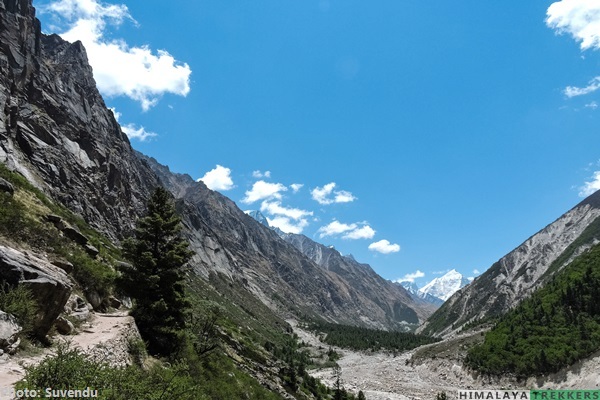 This is among few known trails which takes you to a the core of the Himalayas inside a glacial valley. The word ‘Tapovan’ means a sacred and serene place, where the sages meditate for spiritual bliss. According to Hindu mythology, King Bhagiratha (Lord Rama’s ancestor) of the Ikshvaku dynasty, meditated here to Shiva for Ganga’s descent to the earth. From time unknown, Hindu sadhus or spiritualists come here to pay tribute to Lord Shiva and River Ganges. Tapovan, lush green in summer, blooming with wild flowers, turns golden in post-monsoon season. The valley, flanked by majestic Himalayan peaks like Mt. 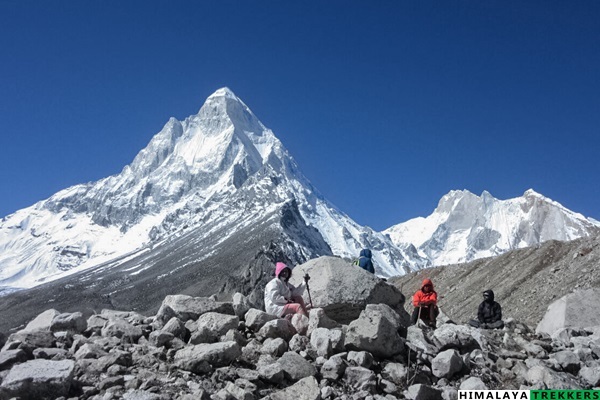 Shivling (6543 m), Mt. 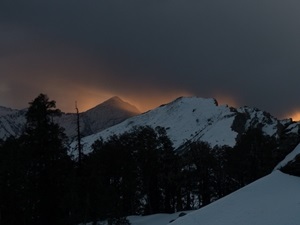 Meru (6630 m) and Kedar Dome (6808 m) is a favourite destination for trekking enthusiastic, both Indians and foreigners. 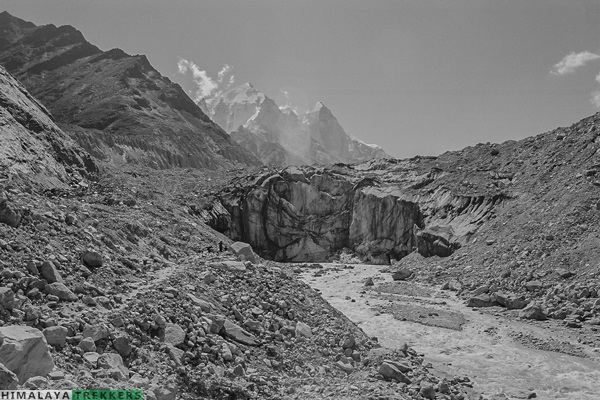 The Bhagirathi Group of peaks – I (6,856 m), II (6,512 m) and III (6,454 m) are visible on the eastern bank of Gangotri glacier. The trail from Gangotri to Tapovan via, Bhujbasa and Gomukh, is only 24 km and two days trek but it covers a vast array of Geo-morphological features, like the ‘I’ shaped river gorge of Ganges, then the snout of the glacier from where the river originates, followed by the glacier itself with lateral moraine and ice covered glacial debris and finally the steep edge of the glacier. Initially the trail runs amidst pine and birch forest, but crosses the tree line to reach this Alpine meadow where only perennial grasses, sedges, and forbs can survive. 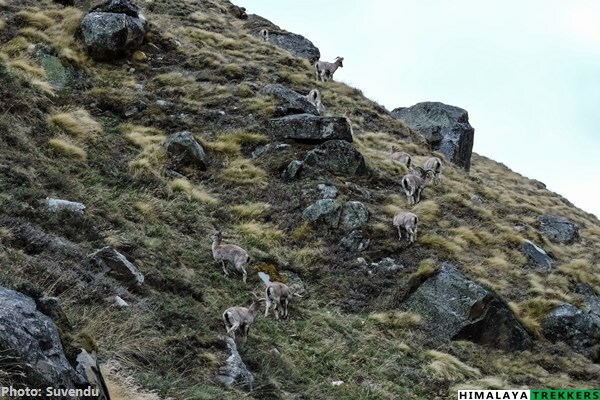 Sighting of Bharals (Blue Mountain Sheep) on nearby mountain slopes is common. 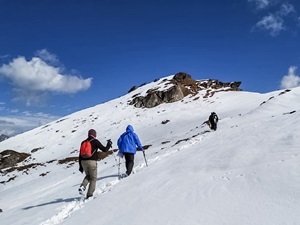 The high altitude, rarity of oxygen, average 6-7 km walk in the difficult terrain and the erratic weather make this a short but challenging trek. Day 1: Drive from Dehradun to Gangotri– 245 km – 11/12 hours. Day 2: Gangotri active acclimatisation day, height gain on Kedartal route. 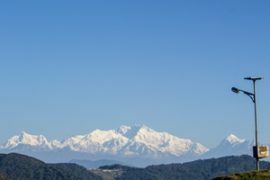 Day 3: Trek to Bhujbasa – 14 km – 6/7 hours. Day 5: Exploring Tapovan meadows, visit to Neela Tal and back – 4 hours. 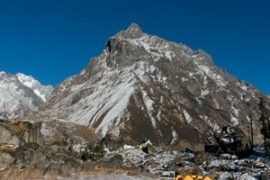 Why Tapovan trek is NOT suitable for a reasonably fit beginner? 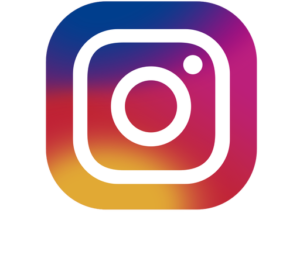 There are quite a few Moderate grade treks which we suggest in planning of your first time trek on the Himalayas. However Tapovan being also graded as “Moderate” but NOT really a trail which we recommend as your first trek. It isn’t the highest altitude of this trail which is too high, rather the trail reaches relatively lower highest altitude. 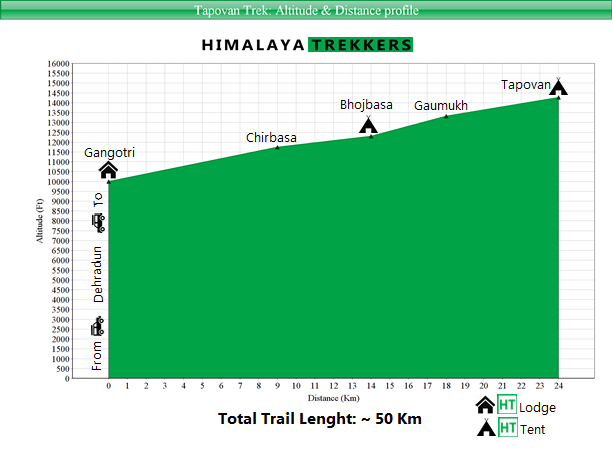 The trail till Bhojbasa is relatively easy on wide track. 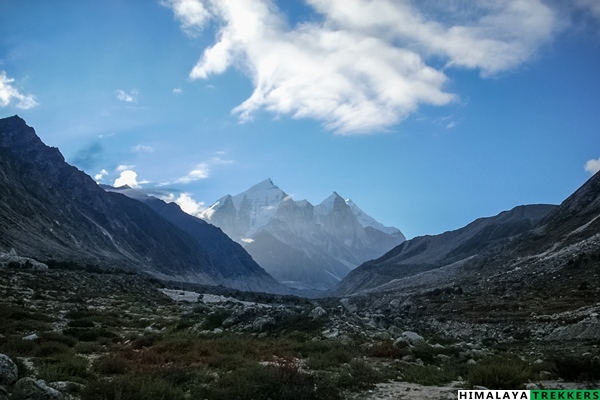 Things start changing as you approach towards the Gangotri glacier’s famous snout Gaumukh. 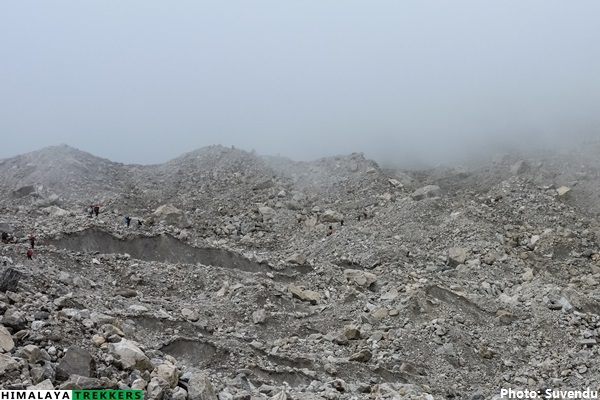 On popular “Moderate” treks like Roopkund, Rupin, Goecha La and others you don’t need to negotiate a glacier, more specifically on deposited moraine. Moraine is rocks, boulders, scree and debris carried down by the glacier. One Km hopping on this terrain can be physically demanding as twice the distance. 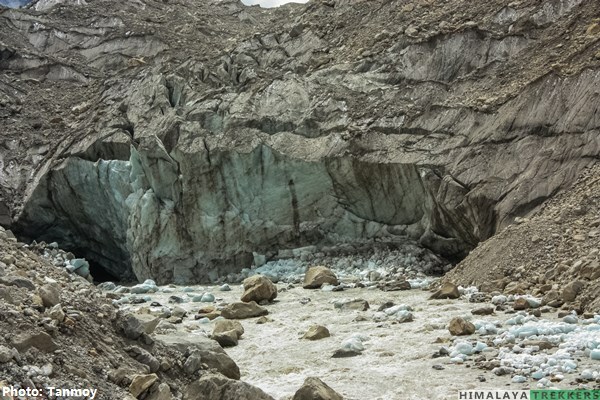 It takes 3/4 hours to cross Gangotri glacier breath-wise and the the final climb to Tapovan, for a reasonable fit and well acclimatised person. Prior trekking experience(s) will prepare you both physically and mentally for this challenge. 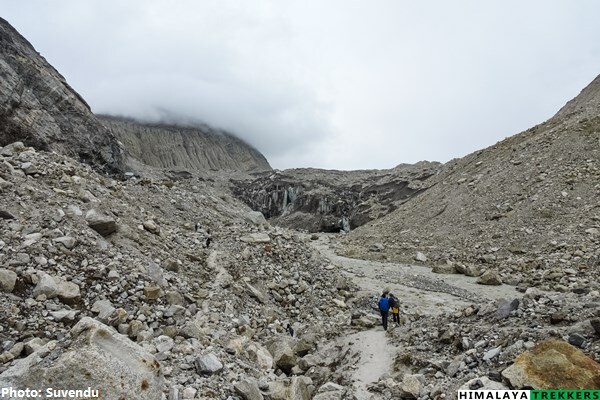 Furthermore this glacier valley lacks oxygen, resulting in more challenges from acclimatisation perspective. 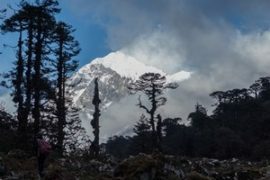 Our itinerary has a full rest and acclimatisation day at Gangotri, still a considerable number of trekkers struggle to cope with rarefied oxygen on difficult terrain. Acclimatisation problem can happen to anyone, but people with prior acclimatisation problem will face problem on this trail for certain. 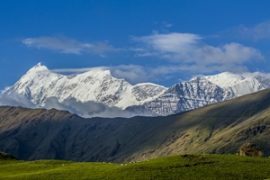 We recommend Tapovan trek to trekkers who have at least twice been on high altitude treks (on or above ~4000 m/13000 ft) with good physical fitness and no prior acclimatisation issues reported. 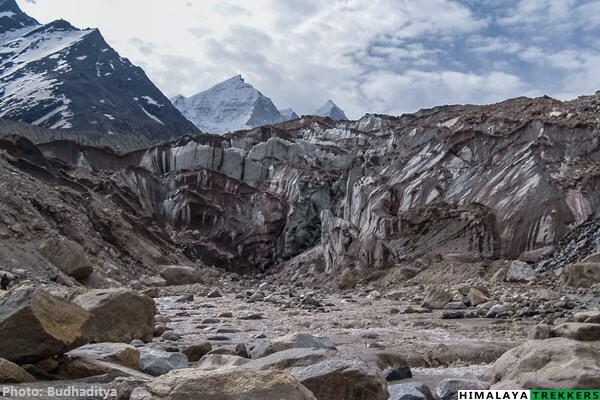 There is no debate now on that the “Climatic change” is affecting the Himalayas in general. 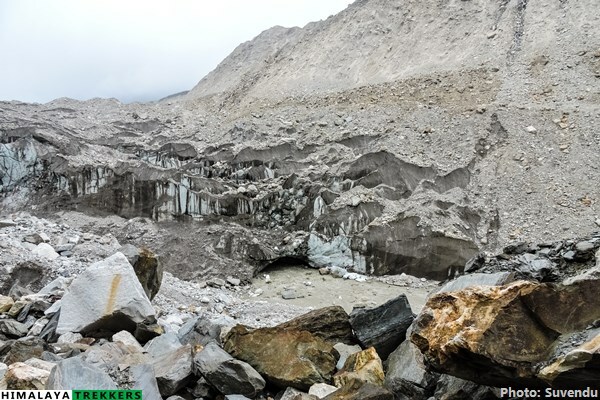 Increase of receding glaciers are alarming for quite sometime. 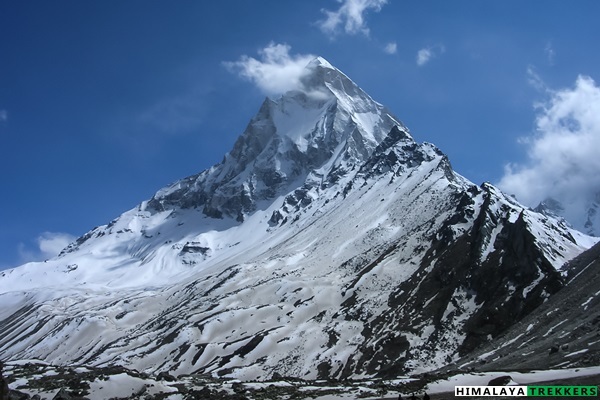 Gangotri glacier is a prominent example. The glacier retreated more than a kilometre in last 30 years or so. We organised our first trek to Tapovan back in 2011 and since then observed the trail course. 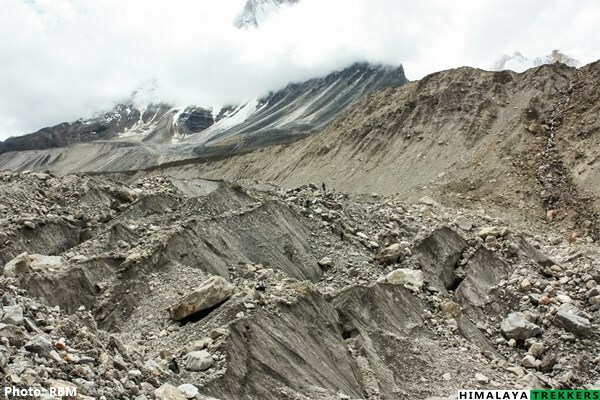 On glacier and moraine trekking groups keep changing their path suitable up to Tapovan almost every year. A study of NASA in the beginning of millennia can be found here. 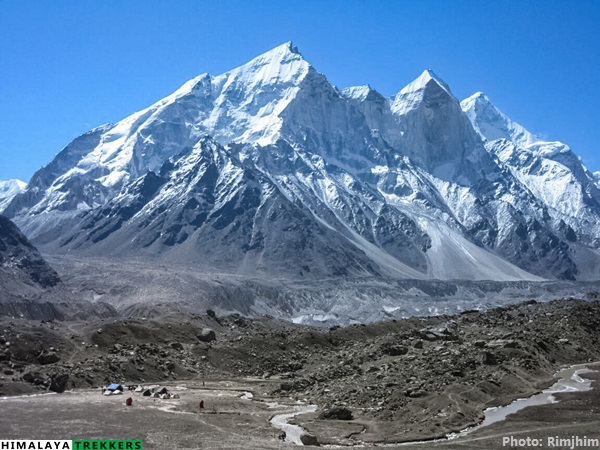 Depending upon the number of trekkers we may arrange a car pickup from Dehradun to Gangotri and back. This will get equally divided amongst the trekkers opting. You pay directly to the driver. At present a Tata Sumo/Maxx type vehicles charge ₹ 8000 for drop from Dehradun to Gangotri. This can accommodate 5-7 persons. Similarly Gangotri to Bhatwari is ₹ 3000 and another ₹ 5000 from Bhatwari to Dehradun by Tata Sumo. 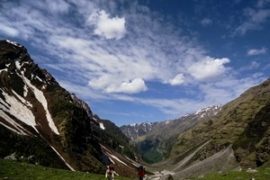 Duration: 5 days of trekking; Dehradun to Dehradun in 8 days. 2 night’s accommodation at Gangotri (Day 1 & Day 2) and one night at Bhatwari (Day 7) in lodge on sharing basis and dinner. 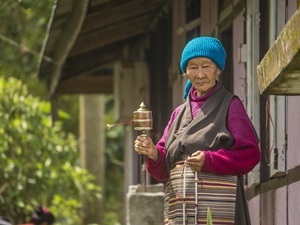 All meals during the trek. Regular Indian style nutritious vegetarian food during the trek, breakfast packed/hot lunch (depending upon the time you reach a campsite), snacks, dinner along with coffee/tea/soup. 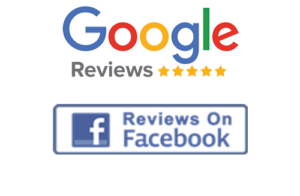 We assume that you will carry your personal Rucksack/Backpack with all your personal belongings. If you want to offload your Rucksack and be carried by our Pack Animal/Porter then you need to pay additional ₹ 2500 for the entire duration of the trek. The Rucksack should not weigh more than 10 Kg.